What if you received a call from a stranger days after moving into your new home declaring they they are, in fact, the rightful owner of the property you just bought? Clearly not a situation that you want to be in, but the truth is that this does happen from time to time. For example, sometimes forged or fraudulent papers are used by sellers to obtain a payday for a home that doesn’t really belong to them. Though this particular scenario wouldn’t be called a common occurrence in the industry, the fact remains that more than half of all transactions in real estate have an issue of some sort that is related to the title. This is where Saint George title insurance comes in. Saint George title insurance prevents circumstances like the one described above from happening as well as provides protection during unforeseen title-related problems. The truth is that there is so much paperwork to sign during the closing process that sometimes the nature and purpose of certain documents get either overlooked or under-explained. What is Saint George title insurance and why is it necessary? Answers below. In the world of real estate, terms can sometimes be a bit puzzling. To begin, there a four terms that are important to know. A title is a document proving that a person owns a property, legally. Escrow indicates a time period where home sale funds are held by a third party until it’s time to complete the purchase. A title search refers to the process of locating any possible problems or mishaps associated with a particular title. And finally, a lien refers to the assumption of ownership by one person over another in the event money is owed. As can be assumed, Saint George title insurance provides protection similar to any other kind of insurance that you may be familiar with. However, rather than protecting from potential trouble in the future (as is typically assumed with insurance in general), Saint George title insurance protects from trouble that has already happened; past incidents. So instead of covering floods and fires, title insurance protects from paperwork that wasn’t filed properly, to name one example. 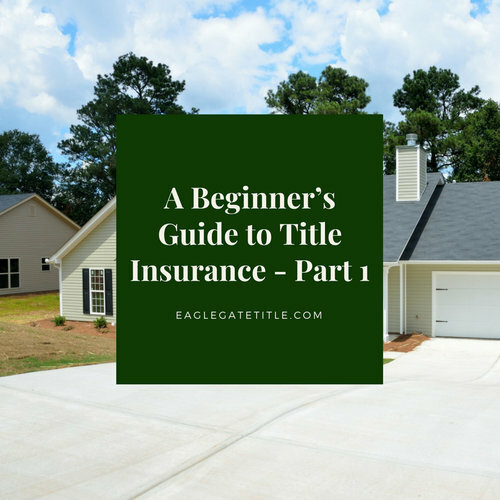 In the field of title insurance, there are two different kinds: owner’s and lender’s. Owner’s insurance protects the person purchasing the property from any potential issue that is related to the title. Sometimes, even though a meticulous title searched is performed, issues can still arise that are usually associated with a mistake made by someone in the past (a county clerk, for example). The cost of this type of Saint George title insurance is dependent on the purchase price of the home and is not contingent on the loan amount. In Utah, the seller typically pays for owner’s insurance only once at the time of closing. Lender’s insurance, on the other hand, covers only the bank (or whoever issued the mortgage loan). Unlike owner’s insurance, the cost here is dependent on the loan amount rather than the price of the home, which continues to decrease with each mortgage payment made over time. When using a title company, an owner’s policy is mandatory. If there is a lender involved on the buyer side, they won’t lend on it without the owners’ policy. And on a cash deal that goes through any title company, the owner’s policy is required as well. The only way they can get by without it is if they go to the county by themselves, draft up a warranty deed, sign it, and transfer it that way. Due to the rules and regulations associated with these policies, it’s important to go through a title company legitimately rather than trying to go to the county yourself and do it. Saint George title insurance is incredibly important. If all you had was lender’s insurance, you wouldn’t have any protection or coverage for the total value of the home. In a way, it’s like the difference between liability coverage and full coverage on your personal vehicle, albeit on a much larger scale. Sure, you might never find yourself in a situation where your Saint George title insurance is necessary. But we guarantee that the peace of mind is worth every penny. 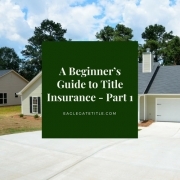 This article will continue with the post A Beginner’s Guide to Title Insurance – Part 2.